Morgantown Apartments with Close Proximity to West Virginia University! WALKING DISTANCE TO SHOPPING, DINING, ENTERTAINMENT AND MORE. Welcome to Heritage Apartments, one of Morgantown’s most unique properties. We are a family owned company with over 60 years in the housing and rental industry. We offer some of the finest apartments conveniently located in the heart of Morgantown’s Suncrest area. 24-hour maintenance service allows us to provide the best tenant experience in Morgantown. 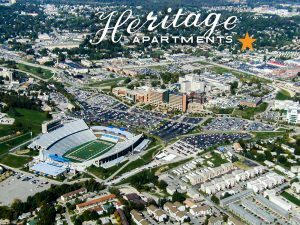 Our beautiful apartments are conveniently located withing walking distance to shopping, dining, entertainment and the West Virginia University Evansdale Campus.